Hotel hair dryers are awful. You can’t dry a hairless cat with one of those things. And when it comes to suitcase space, real estate is valuable — choosing between another pair of shoes (because if it does rain, you will need those rainboots) and your hair dryer is a difficult decision. It’s time to consider a travel hair dryer. Just because it’s small, doesn’t mean it won’t deliver a powerful gust. You may even find yourself tossing your clunky standard edition for one of these little powerhouses. The Revlon 1875 Watt Compact Styler ($15) weighs less than a pound, but still has the wattage of a standard blow dryer. The handle folds in for a compact fit. This tiny pink hair dryer is so cute, it’s almost a shame to keep it in a suitcase. 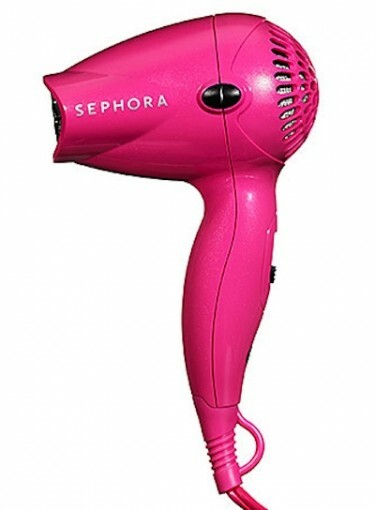 The Sephora Travel Hair Dryer ($39) includes a dual voltage feature for international jetsetters. Packed with advanced features, the Bio Ionic Powerlight Pro Dryer ($140) features negative ions that magically clean and refresh hair, conditioning nano beads for faster drying, and Nanoionic Mineral to condition hair. While we have no idea how any of this works, we assume this travel hair dryer makes all frizz disappear in a battle between good and evil. P.S. More packing tips for vacays.